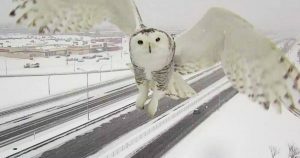 Normally found in the Arctic, a snowy owl made his way down to Montreal and accidentally posed for a photo shoot mid flight! 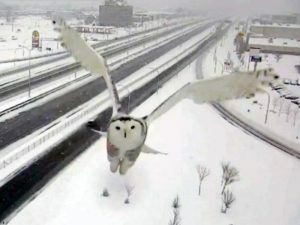 The rare bird was captured in full flight while looking for a place to perch, The Independent reports. Snowy owls nest in the Arctic tundra of the northernmost tips of Alaska, Northern Canada, and Eurasia during the “warm” months and winter south throughout Canada and northern Eurasia. 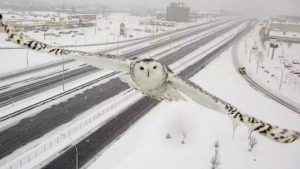 The snowy owl has been been categorized by the International Union for Conservation of Nature as a “vulnerable” species, which means it is likely to become endangered unless the circumstances that are threatening its survival and reproduction improve.